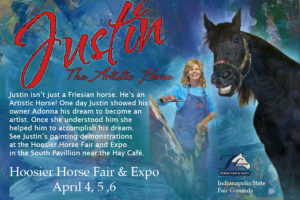 Hey, have you ever seen Justin The Artistic Horse paint? Now is your chance to watch him create a masterpiece of “Unbridled Art”. Join Justin and Adonna for daily painting demonstrations at Hay Café in the South Pavilion. We hope to see you there!